Look up fifty-four in Wiktionary, the free dictionary. 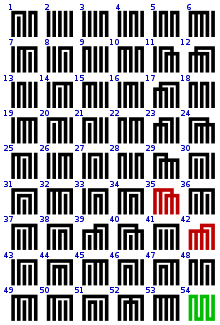 54 (fifty-four) is the natural number following 53 and preceding 55. 54 is a 19-gonal number. Twice the third power of three, 54 is a Leyland number. 54 can be written as the sum of three squares in three different ways: 72 + 22 + 12 = 62 + 32 + 32 = 52 + 52 + 22 = 54. It is the smallest number with this property. Like all other multiples of 6, it is a semiperfect number. In base 10, 54 is a Harshad number. The Holt graph has 54 edges. The sine of an angle of 54 degrees is half the golden ratio. The atomic number of xenon is 54. The number of years in three Saros cycles of eclipses of the sun and moon is known as a Triple Saros or exeligmos (Greek: "turn of the wheel"). The New York Rangers won the Stanley Cup in 1994, 54 years after their previous Cup win. It is the longest drought in the trophy's history. For years car number 54 was driven by NASCAR's Lennie Pond. More recently, it is known as the Nationwide Series car number for Kyle Busch. A score of 54 in golf is colloquially referred to as a perfect round. This score has never been achieved in competition. The number used when a player is defeated 3 games in a row in racquetball. The number of milligrams of caffeine in 12 ounces of Mountain Dew. In the title of a 1960s television show Car 54, Where Are You? ^ "Sloane's A051871 : 19-gonal numbers". The On-Line Encyclopedia of Integer Sequences. OEIS Foundation. Retrieved 2016-05-30. ^ "Sloane's A076980 : Leyland numbers". The On-Line Encyclopedia of Integer Sequences. OEIS Foundation. Retrieved 2016-05-30. ^ "Sloane's A005835 : Pseudoperfect (or semiperfect) numbers". The On-Line Encyclopedia of Integer Sequences. OEIS Foundation. Retrieved 2016-05-30. ^ "Sloane's A005349 : Niven (or Harshad) numbers". The On-Line Encyclopedia of Integer Sequences. OEIS Foundation. Retrieved 2016-05-30. This page was last edited on 11 January 2019, at 11:43 (UTC).